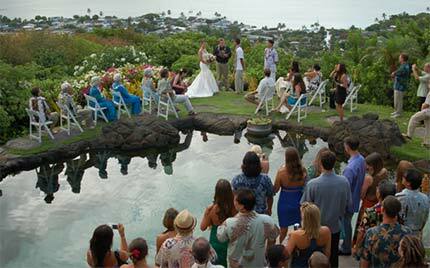 Allow Puakahi to make your most memorable day even more special. Perfect for weddings or vow renewals, our private beautiful estate provides a variety of gardens and view for your wedding and photographs. Many of our couples have selected the poolside point which offers dramatic views across Kane'ohe Bay. For a more intimate setting, you may want to select one of our interior garden areas as your setting. We have separate changing rooms for men and women, bathroom facilities, full kitchen access from which to stage catering, and a covered outdoor gazebo that can accommodate up to 25 people for a seated meal. For larger parties, there is a larger paved area that can accommodate a tent.